I have but one question following every meal at Phil-Am in Colonia: do Filipinos have high cholesterol? It’s just a pondering; a thought that crept into my mind after yet another pork-heavy meal at an authentic Filipino restaurant, the first being Fiesta Grill in Jersey City (where I went a few weeks prior to my first visit here). There were plenty of other entrees available at the counter, but for some reason, I ended up with three different kinds of pork, just like the last time. But, as I was told, this is what they eat “over there”, and me being a willing not-so-ignorant American visitor, I was game. Their diet, which includes a combination of pork belly which is high in fat, thick noodle and rice dishes, and sugary desserts and drinks that pack enough carbs to fuel a marathon run, somehow does not equate to obese patrons. Everyone in the place, from server to customer, was thin as a rail. Am I missing something? If I ate like that on a regular basis, I would balloon up like the Michelin Man. Just like Fiesta Grill, there were no non-Filipinos eating there besides myself, which is always a good sign. I let my friend do the ordering like last time. Just plop some pork and rice on the plate and I’ll be fine. I got the combo dish, which for $5.50 included two gigantic scoops of white rice and a choice of two sides. Using him as my translator and holding up the line as I examined the buffet-like array of foods, I managed to first get an order of crispy spring rolls stuffed with veggies and pork bits. They were good, just like what you might find in a Thai restaurant, and served with a sweet and sour sauce. For my second side, I got something that would probably scare most Americans, and that was Dinuguan, or pork belly and chunks of offal (such as pork livers, kidneys, and other organ meat) cooked in pig’s blood. This was the first time I have ever had a blood sauce, and I must say, it was excellent. It did not look too pleasing (almost black) but that blood just made the meal overwhelmingly rich. If you’ve never had blood before, it is hard to describe. The flavor is not strong, but it adds a thick heartiness, and maybe makes it a little bit more gamey. It is intimidating in name alone. With a side of vinegar to dip in and cut the richness and add some much-needed acidity, the texture and flavor was perfect. I would go back again just for that. Funny story: when I ordered the Dinuguan, all four workers behind the counter looked at us. One even asked if I was Filipino because no non-Filipino has ever ordered that particular item. I said I wasn’t, and just wanted to try it because it sounded good. They chuckled and talked amongst themselves. When we sat at the table, he said that I had impressed them with my order. Nothing like some street-cred in the form of pig’s blood. But to me, I wasn’t being so brave. When I go to an authentic eatery, I want to order what the natives eat—what the immigrants and expats miss from their home country. I can get noodles or fried rice anywhere. I want something unique that maybe you can’t find somewhere else except a grandmother’s kitchen. There’s nothing I despise more than your stereotypical close-minded American who won’t eat something out of his or her comfort zone because “that’s icky”. As I continued my way down the line, I added one more item, Binagoongnan, which was pork belly in a shrimp sauce. This I was not a big fan of. The sauce was good, adding a nice saltiness, but the meat was pretty much all fat and bone. I also tried a Longganisa, which was a sausage that he ordered. It might have been the most amazing thing of all that I tasted today. The tenderness and flavor was indescribable and shockingly good. It also had a pleasant, underlying sweetness. I don’t know what exactly it was stuffed with, but if I was a betting man, I’d guess…more pork! 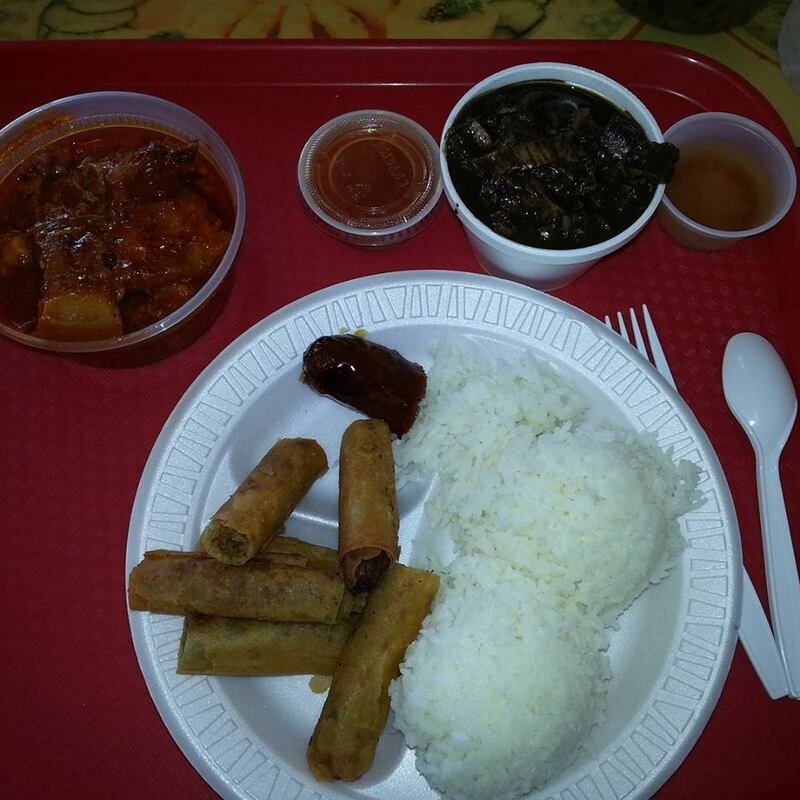 So, that was two Filipino restaurants for me this summer, and the reviews and overall scores came out nearly identical: a hole-in-the-wall where the locals eat, trying to churn up memories of home cooking, where I pretty much enjoyed all that I ate. Both places had the same set-up by way of a counter and hot bar where you can work your way down and just point out what you want. Even with such similarities, I give a slight edge to Phil-Am. It was cleaner, the service was very friendly and helpful, and the Longganisa and Dinuguan just blew my mind. 4 out of 5 stars. This review was previously published here. Phil-Am is located at 1246 NJ 27 in Colinia, New Jersey.